"NEW YORK TIMES "BESTSELLER The "New York Times" bestselling author of "The Brain That Changes Itself "presents astounding advances in the treatment of brain injury and illness. Now in an updated and expanded paperback edition. Winner of the 2015 Gold Nautilus Award in Science & Cosmology In his groundbreaking work "The Brain That Changes Itself," Norman Doidge introduced readers to neuroplasticity the brain s ability to change its own structure and function in response to activity and mental experience. Now his revolutionary new book shows how the amazing process of neuroplastic healing really works. "The Brain s Way of Healin"g describes natural, noninvasive avenues into the brain provided by the energy around us in light, sound, vibration, and movement that can awaken the brain s own healing capacities without producing unpleasant side effects. Doidge explores cases where patients alleviated chronic pain; recovered from debilitating strokes, brain injuries, and learning disorders; overcame attention deficit and learning disorders; and found relief from symptoms of autism, multiple sclerosis, Parkinson s disease, and cerebral palsy. And we learn how to vastly reduce the risk of dementia, with simple approaches anyone can use. For centuries it was believed that the brain s complexity prevented recovery from damage or disease. 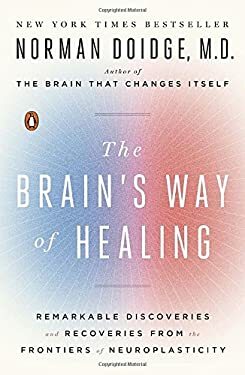 "The Brain s Way of Healing" shows that this very sophistication is the source of a unique kind of healing. As he did so lucidly in "The Brain That Changes Itself," Doidge uses stories to present cutting-edge science with practical real-world applications, and principles that everyone can apply to improve their brain s performance and health."